I’m not a big politics person, so the purpose of this post being several days after the midterm election is because I find the election period overwhelming. There are endless advertisements everywhere, including social media. 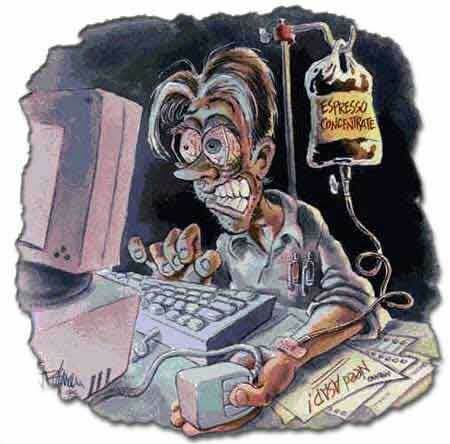 As I jumped on Twitter Tuesday night I was welcomed by a seemingly endless stream of election results. I follow several local and national affiliates, however the three dominating the election talk on my Twitter feed were the Wall Street Journal, New York Times and NPR. Because I didn’t stay on for long I didn’t notice any specific trends, however, apparently this round of elections was revolutionary for both Twitter and the news media!Even Twitter wrote a story about how impressed they were with the success of Twitter usage for election related news. 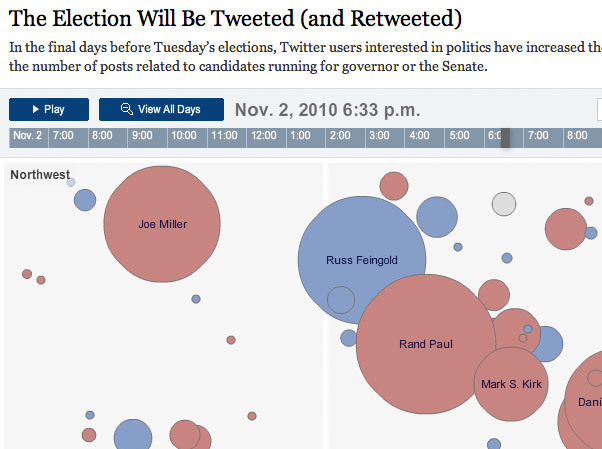 The New York Times attempted to stand out by utilizing a visualization of the conversations occurring on Twitter as well as a streamline of tweets. The Senate races starting October 21 and ending on election day can be seen here, but below is a static picture of the visualization. CNN also created a visual using the tweets directed at monitoring the conversations on Twitter. For instance, CNN posted several different maps of what people were talking about. One compilation answered the question, “Why are you voting” but it was not a poll or a direct question, just simply what people were tweeting about. They also used this same visual on CNN television. What a great analysis of the election’s presence on Twitter! Lastly, the Washington Post did something no one had ever done before as well. They became the first organization to buy one of Twitter’s “promoted trends.” This looks just like a normal tweet, but it notes that it has been paid for by an advertiser. When anyone used the hashtag #elections, it would promote the Washington post first. According to a post-election article measuring the success of this promotion, the Washington Post said it was successful in driving traffic to the paper’s website but that their main purpose was to just be at the center of the conversation. The innovative ways in which these organizations used social media to engage with the audience though analysis and conversation proved they were accepting this new trend in resources for information. While some people might still be in shock that many people rely on Yahoo or other online sources to receive their news, that is officially, for lack of better terms, old news. The new trend is in social media and especially using Twitter as an outlet for delivering news. It is mobile, fast and it is here to stay. For these three news outlets to reach out to their audience in such a different way shows real progression. I realize my mind was focused on homecoming preparations a lot the past weekend, but I am wondering how I missed the fact that astronaut, Douglas H. Wheelock, unlocked a new badge on Foursquare from space. First of all, though these astronauts have been traveling in space all summer, I had no idea they were able to use their phones and tweet along their journey! According to Mashable, astronauts have been tweeting since 2009, so clearly my social media knowledge is not as great as I had hoped. While I understand there are satellites in the sky, I still find it amazing that they are even able to do anything with his cell phone. The important question is, who will become the next mayor of space? According to an article on Mashable, soon non-astronauts can unlock the badge as well by visiting and checking in at NASSA related locations listed at their Foursquare page. Wheelock and his team of astronauts are continuing to tweet about what they are doing and what they see. A couple of other astronauts have chosen to share their experience via social media as well. Shannon Walker keeps a blog and Scott Kelly tweets about their mission and daily tasks (@stationcdrkelly). Douglas has also created a game with his pictures as he uploads a new picture every so often and has viewers guess what city or landmark the shuttle is orbiting above. Viewers have a lot of fun trying to guess where he is and watching the pictures. There were 37 comments on the photo above and they trickle in long after the initial post. This seems like an extremely effective use of social media for NASSA. Most likely these astronauts were trained before entering space as to how to utilize social media. The instant communication we have with someone in outer space is a genius way to promote the space program. I learned so much more from this discovery than I ever would have if I had relied on traditional media outlets. 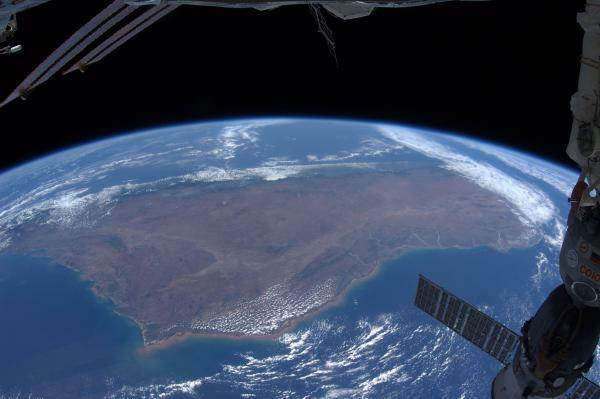 Did you know that astronauts were tweeting from space? Thanks for your thougths!